You don’t have to be an avid gardner to love this tip. 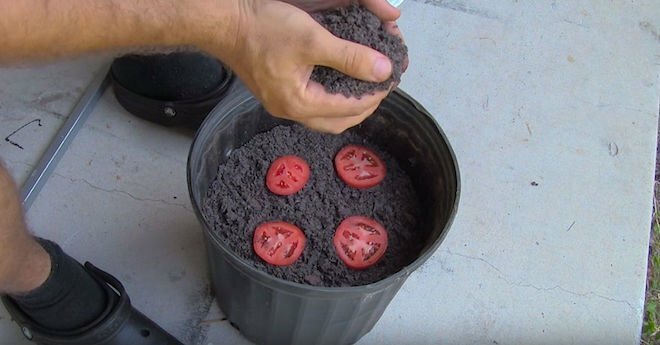 Here’s a quick and easy way for how to grow tomatoes using the overripe ones you may have in your fridge! The Wannabe Homesteader demonstrates what to do. He takes an overripe tomato and a pot with some soil (he uses compost potting soil). First, he slices the tomato into quarter-inch thick slices. He then throws four pieces into the pot and covers them over with a sprinkle of dirt, just enough so they are covered. Water them every once and a while and within a week-and-a-half you should have a pot filled with 50 or 60 sprouting seedlings! At this stage, the gardner suggests transplanting the bigger, stronger seedlings into other pots (2 per pot) to let them grow. That’s it! I love the taste of fresh-grown tomatoes, so I’ll most definitely be trying this out. Share this gardening tip with your friends!